Throughout his career, Nicholas Ray returned repeatedly to an examination of the nature of masculinity and its relation to the way in which society is organized. His view was pessimistic, but also romantic in the sense that it saw a destructive conflict between the essential nature of the individual and the constraints imposed on the individual by society. In Ray’s work this conflict again and again gives rise to violence, directed both internally and externally. Internal conflict arises from social demands to “be a man”, to suppress “weakness” and emotion. Anger and depression are inevitable consequences, as can be seen most clearly in Jim Stark’s torment in Rebel Without a Cause (1956). When the individual’s response is turned outward, it results in violence, particularly directed towards the others who are perceived as responsible for those social constraints. Ray, particularly in his finest works of the ’50s, examined these questions of male identity and the roots of violence from a number of angles. At one extreme, in Johnny Guitar (1954), his deconstruction of the western, he created a hero who has abandoned the “masculine” role, replacing his gun with a guitar, turning his back on violence, substituting music for killing. Here the usually masculine roles are divided between two women, Joan Crawford’s saloon owner Vienna who represents benign authority, and Mercedes McCambridge’s Emma, a woman driven to extremes by her confused and repressed sexual desire (ostensibly she’s Vienna’s rival for Scott Brady’s Dancin’ Kid – his name itself another indication of the film’s gender confusions). It’s pretty clear that Emma is driven to violent hysteria by her unadmitted desire for Vienna herself, sucking everybody else into her destructive orbit. Seeing these women acting out exaggerations of usually masculine roles appalls the men involved. At the other end of the scale is Ray’s masterpiece Bigger Than Life (1956), which transforms the domestic melodrama of middle class family life into an allegory of the violence implicit in Judeo-Christian patriarchal authority. Here the story of Abraham and Isaac is played out in suburbia, with James Mason’s father demanding absolute obedience to his will from wife and son; their failure to live up to his expectations leads to what he sees as the necessity of sacrificing his son. What Bigger Than Life shows is that masculinity is all about control. The world must be bent to fit the male protagonist’s subjective perceptions, because if that world objectively exists outside himself, with a nature of its own independent of him, then the essence of his identity comes into question. For Ray, the violence of masculinity is a paradoxical expression of weakness and insecurity, the fear that after all the world doesn’t exist purely to validate the man’s sense of himself. 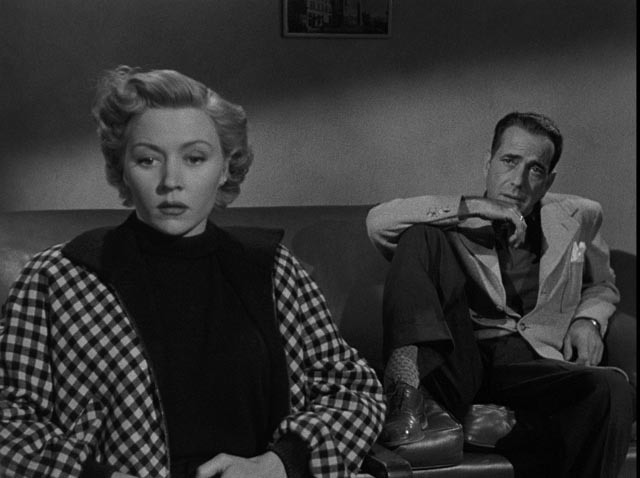 His other ’50s masterpiece, In a Lonely Place (1950), is at once his bleakest and most personal expression of this theme. It is also one of the great dark depictions of Hollywood, the “dream factory” itself an expression of those efforts to remake the world as a reflection of masculinity’s overblown sense of itself. This is a town full of ambitious blowhards always teetering on the edge of failure, becoming louder and more assertive the closer they get to losing their precarious social position. 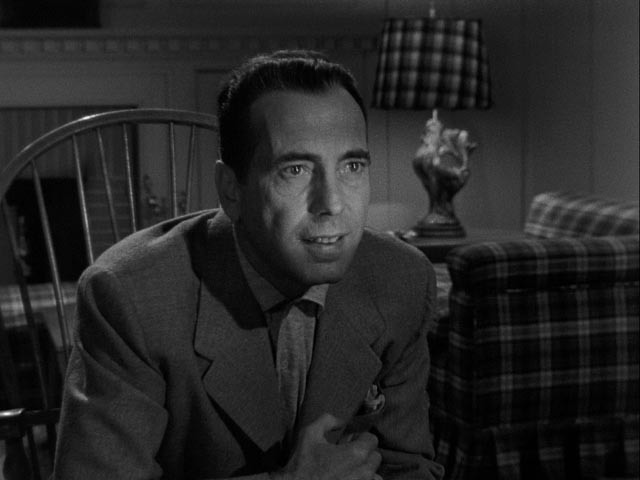 Dixon Steele (Humphrey Bogart) is a screenwriter who hasn’t had a hit since before the war. Prone to outbursts of anger and violence, he recasts his decline as the industry’s failure to recognize his superiority and the studios’ demands that he write rubbish that’s beneath him. Having been asked to adapt a popular piece of trashy fiction, one evening he invites a hatcheck girl named Mildred Atkinson (Martha Stewart) home to his apartment to tell him the book’s story because he can’t be bothered to read it. This sequence is loaded with ambiguities; the girl suspects that he has ulterior, sexual motives and coyly expresses her own propriety; Dix denies any such motives, yet gives numerous signals that this may be what he has in mind. The fact that he doesn’t take action may indicate feelings of impotence. The girl, eventually sent on her way, seems disappointed that nothing happened with this supposed celebrity. When Mildred turns up dead the next morning, her body dumped in a canyon, Dix is called in by the police for questioning. To them – including his old army buddy, now detective, Brub Nicolai (Frank Lovejoy) – Dix seems the likeliest suspect. But he has an alibi in a neighbour who saw the girl leave his apartment alone. This is Laurel Grey (Gloria Grahame), a woman who has drifted to Hollywood for the same reason as so many others, in a vague hope to make something of herself in the movies. Her statement gets Dix off the immediate hook, although police suspicion hasn’t been completely allayed. Meanwhile, Dix and Laurel embark on a relationship; under her influence, he starts adapting the book. She takes care of the mundane details of daily life, facilitating his creativity and protecting him from distractions. Despite the production code’s constraints, the film implies that they have an active sexual relationship to go along with their creative partnership. Interestingly, Laurel as played by Grahame is hardly a compliant or subservient character; she is as strong-willed as Dix and as fiercely defensive of his innocence as he is himself. And yet Dix continuously undermines himself by his efforts to maintain an impregnable air of masculine authority. When first confronted with the fact of Mildred’s death, he shows little reaction and no concern, responding to the questions of Captain Lochner (Carl Benton Reid) with glib quips. In the film’s most chilling scene, Dix has been invited home for dinner by Brub; after eating, Dix takes on the role of writer and director by getting Brub and his wife Sylvia (Jeff Donnell) to reenact the murder as he believes it must have happened. Dix is terribly convincing, feeding Brub’s own unwanted suspicions. After Dix leaves, Sylvia comments that he’s a very sick man. But for Dix this is all a game, displaying his own creative imagination. What begins as a positive, supportive romance with Laurel gradually grows darker. Dix is unable to control the circumstances surrounding Mildred’s death and he increasingly gives way to outbursts of anger and threats of violence. When Laurel sees him almost beat a young man to death over a minor traffic accident, she starts to have doubts about his innocence; she believes she loves him, but now she begins to fear him. And the more Dix senses her doubts, the more he feels a compulsion to control her. Paradoxically, the more violent he becomes, the more the men around him – Brub, Dix’s agent Mel Lippman (Art Smith) – excuse his erratic behaviour. The anger and potential for violence are dismissed as an essential part of his creativity, something that must be put up with because he’s such a genius writer. In this world, the man must be deferred to no matter how bad his behaviour. By the time he is finally cleared of suspicion in Mildred’s death, it is too late. He has revealed all too clearly that he is in fact capable of extreme violence. 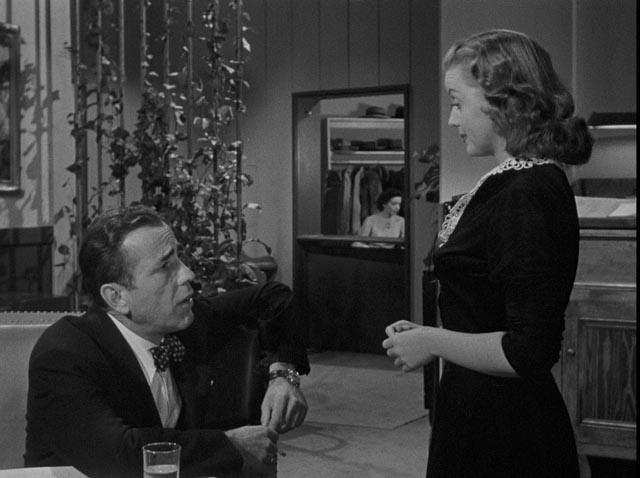 In a Lonely Place ends in a moment a bleak hopelessness, Dix’s flawed masculinity having smashed any possibility of a sustained emotional relationship with Laurel. Unlike that other great film about the dark underbelly of the movie business, Billy Wilder’s Sunset Boulevard (also 1950), In a Lonely Place doesn’t cushion its impact with satirical detachment. This is a raw and brutal film, rooted in the actual lives of its director and its star. 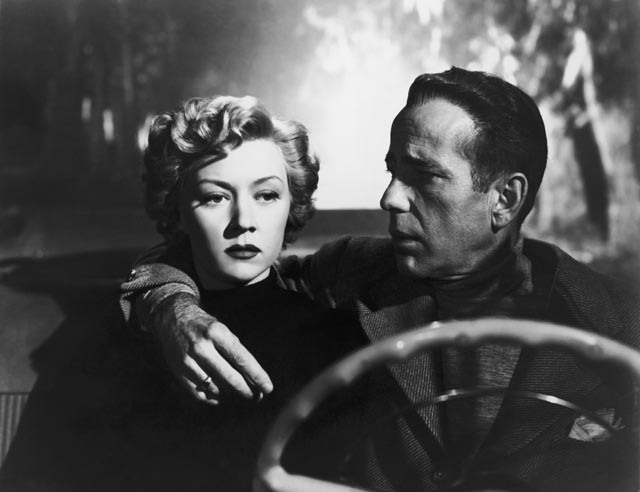 Dix, with his propensity for brawling, was acknowledged to be close to Bogart’s own persona, while Ray as he made the film was going through a rocky break-up with his then wife, Gloria Grahame. That both these men were willing to paint such a dark semi-autobiographical portrait is chilling. 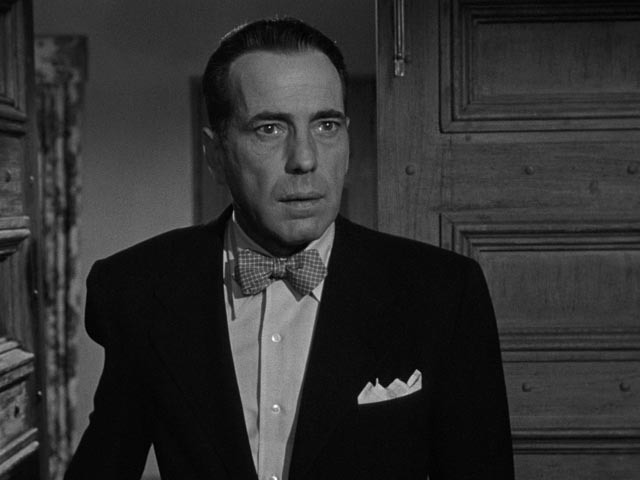 That the film goes so far beyond the personal to create a rich and detailed portrait of a town and a way of life, and of the flawed psychology of the people who lived and worked there, is a tribute to Ray’s and Bogart’s artistry. 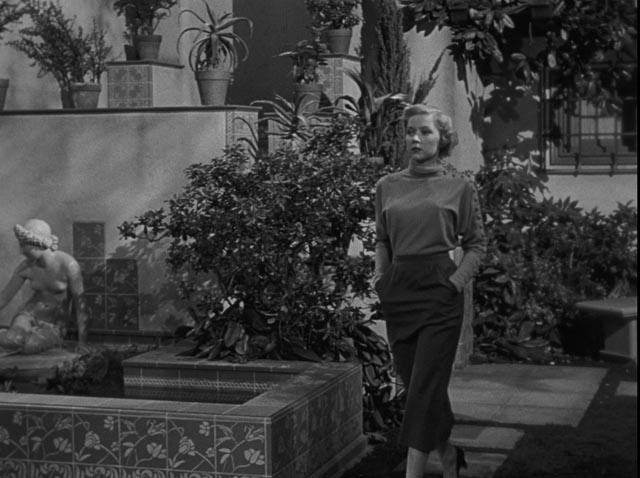 But that said, it is Gloria Grahame who secures the film’s classic status. This was the role of her career and she seized it to create a remarkable character, subtle and ambiguous, yet ultimately a strong answer to the efforts of Dix to constrain and define her. Criterion’s Blu-ray presents an excellent representation of Burnett Guffey’s moody black-and-white photography with a 2K scan from a fine-grain positive master. The image has rich blacks, strong contrast, and a natural-looking film grain texture. The mono audio is clean, supporting both dialogue and George Antheil’s evocative score. The disk’s producer Curtis Tsui provides a strong collection of special features, beginning with Dana Polan’s commentary which provides a close analytical reading of the film as well as information about the production and its place in both Ray’s and Bogart’s careers. I’m a Stranger Here Myself (1975, 40:33), by David Helpern Jr and James C. Gutman, is a slightly shortened version of a black-and-white documentary about Ray shot while he was working with his students at Harper College on the experimental feature We Can’t Go Home Again; the teacher/director comes across as obsessive and demanding, yet also inspiring in his passion for filmmaking. The print source is in very rough shape. Bad and Beautiful: Gloria Grahame (2015, 16:40) is an interview featurette with Grahame’s biographer Vincent Curcio, who talks about the actress’ career and the connections between In a Lonely Place and the disintegration of Ray and Grahame’s marriage. 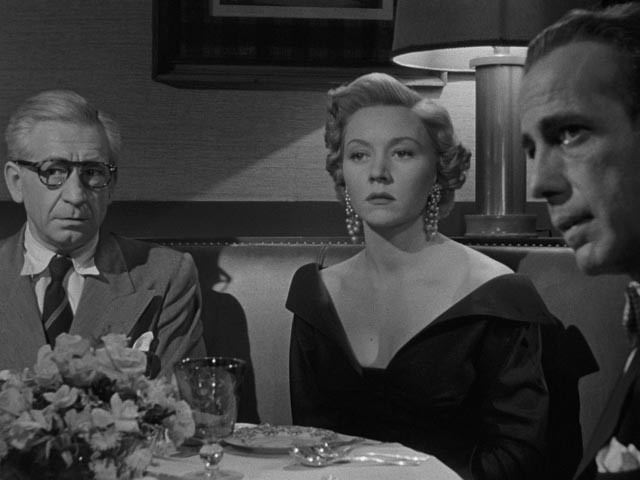 “In a Lonely Place” Revisited (2002, 20:23) is a personal tribute to the film from director Curtis Hanson, who situates the film in Ray’s own circumstances in Hollywood as a strong, independent creative artist constrained by the commercial demands of the studios. Hanson sees Dix as a powerless artist responding with anger and paranoia to being told exactly what to write. An interesting addition is a radio adaptation of Dorothy Hughes’ original novel broadcast by the venerable drama series Suspense in 1948 (59:56). Produced by and starring Robert Montgomery, it provides a fascinating glimpse of just how Ray and his scriptwriter Andrew Solt transformed the story into something which reflected their own concerns. Hughes’ story actually takes the point of view of a serial killer. Dix Steele, having been rejected by the woman he loved, takes his revenge repeatedly on other women. His relationship with former army buddy Brub and his boss Captain Lochner is similar to the one in the film, except that Dix is the killer and his arrogance pushes him to take increasing risks to prove to himself that he is superior to them, that his personal power protects him from discovery. In making Dix in the film innocent of the murder, Ray and Solt broaden the character’s misogynistic arrogance to men in general, while simultaneously giving more power to the woman who gradually becomes the story’s focal point. There is also a trailer (2:27) and the insert essay is by critic Imogen Sara Smith. This entry was posted in Review and tagged Actors, Adaptation, Blu-Ray, Criterion, Directors, Film Noir, Thrillers. Bookmark the permalink.